Given this is our last home game of the season I thought it appropriate to look back over the season and at the same time let our sponsors and fans know where I am at personally in terms of stability for the club. It could prove not to be our last game here at LSV should we be involved in the Million Pound Game with a home tie but as that is not known I will take the opportunity now. This time last year was a joyous, memorable occasion. We had secured Super League status and were hosting Batley with free entry to the public of the town which was gratefully accepted with a huge turnout. The purpose of this was not only to celebrate the success but to introduce people who may not have been to the Stadium and the Club in the hope that they would return. The early successes, in particular against Saints and Warrington, saw a significant increase in support which really did make a difference. We started well as we had prepared well in the off season with our usual trip to La Santa and a good pre-season as we knew it was about getting the good start to hopefully avoid the bottom four, although our real objective was always Super League survival. We had a great performance against Huddersfield and equally against Leeds, a game I feel we could and should have won if only Tils had made that final pass. The tides turned for me when we played Wakefield away and went in at half-time two scores up. The second half was a disaster and I have to be careful what I say here but I made it clear to the powers that be that I wasn’t happy with the way the game was officiated. One regret I do have from that, if I am honest, is putting the footage of the try that never was that cost us the game on social media as it obviously embarrassed the officials and I don’t think that helped us at all. I became more and more frustrated with decisions that seemed to be going against us in games and, as is widely known, I then spoke out about it after the Castleford game. It wasn’t that I thought it would have made any difference to the result, as that was never in doubt – Cas were streets ahead of us and indeed were ahead of everyone which they proved winning the Shield with games to spare. Again, looking back, it wouldn’t have helped us but apart from using the words “joke shop,” which I regret and apologised for, I stand by what I said and feel I was right to speak my mind which got a lot of support on social media. I mix with the CEOs and Chairmen of the other Super League clubs and was merely saying what others thought and indeed some had publicly said before. I do also, however, stand by my comments in support of referees in that I think there is too much for them to have to deal with at a fast pace and it is impossible to get everything right. To me the issue is that the consequences for some minor misdemeanours or technical errors is too great and that is what I believe is harming the game and needs looking at. For example, when markers aren’t square or someone is offside but not actually involved should the consequence of that be that the opposition gets to take thirty metres out of you with a kick, then get a full set again? Would it not be better and keep the game more territorial if say that particular tackle wasn’t counted in the set, so if it occurred on play three you were still on play three. It would still have the desired effect of stopping players doing it. You could then have the serious penalty for outright foul or dangerous play that really hurts you. Even a knock-on, why does this have to hand the ball back to the opposition if you have managed to recover it? Would it not be better if it just counted as a tackle so the side with the ball got to see out their set? There is less flair in the game and you rarely see teams scoring from inside their own territory coming out of yardage with expansive play. More often than not you only get to good ball from yardage by way of a penalty. I don’t have all the answers; these are just some observations that will no doubt split opinion. The other reason I spoke out at this point was in support of my Coach whom week on week put up with everything and never once blamed anyone other than himself for the defeats and I just felt I needed to show him some support. Before the season started I had told myself it would be tough over the long haul but I had also told myself and my wife and children that we were going to enjoy it and we were particularly looking forward to three occasions: Magic Weekend, Wigan at home and Catalans away. I wasn’t let down with any of them and despite what happens this season or with my time as a whole at the helm of this Club I have created memories with my family I will treasure forever. Magic Weekend was even more special for me and my family as it culminated a transformation in me as a person that has improved my family life. My challenge with Marwan gave me a real focus on myself and if that is all I get from owning this Club then it will have been worth every penny as I feel like a new person with self-esteem and a return of my personal confidence. I have become really good friends with Marwan as have both of our families. I really like him and know him well. He is a very smart and caring individual and has a fantastic sense of humour. Our families have shared some great times together and again, if this is something I get to treasure from my time in the game it has been worthwhile and is another positive from the season. When we did Judge Rinder, which was great fun, Marwan vowed at the end that he would beat me three times on the field and he looked good for it, having beaten us at his place and Magic but we put pay to that at the end of the season with a solid performance. Contrary to what some people think, I don’t speak to the lads in the changing room or get involved in team selection. However, if I feel it is necessary to speak to the lads I do so in the players’ room. Generally, that is to set goals at the beginning of the season or to thank them for something in particular. This season there were two occasions when I felt I had to speak to them and both were after Widnes games. The game at LSV was, in my opinion, our worst performance. We showed no desire or fight and I wasn’t prepared to accept that. I explained to the lads that I am a very proud person and proud of the town the Club and the people who support it and I don’t give in at anything. I explained I can accept losing a fight but I can’t accept not getting involved in it. I made it clear that I wouldn’t finance and support a group that showed no desire or fight but by the same token I would back and go down fighting with a group committed to the cause. The lowest point for me during the season was after the Widnes fixture away. It was arguably our last chance of avoiding the Middle 8s. They were bottom and if we were going to get out we needed to win that game. It was widely publicised I had left at half-time which is true but that wasn’t because of the performance as that isn’t my style; it was because I had taken my friend’s son to his prom around the corner in my car which I didn’t want to be leaving in as fans were pouring out. I had arranged to watch the second half on Sky with the Mrs irrespective of how it was going. Our performance was simply not acceptable that day and I really did start to become concerned at this point. I spoke to the lads the following morning in the players’ room. Now, whilst most of you will picture me ranting and raving in an aggressive manner, let me tell you I have never done that in my time at the Club. It isn’t a way to get attention, focus or respect to a group of players. I asked them to put their hand in the air if they believed they had given everything they had in their body to winning that game. I was really appreciative of the honesty of the group when only four hands came into the air. I said I wasn’t there to judge who should or shouldn’t have their hand up but we had a problem on our hands when we were effectively playing to secure our future and we didn’t have a show of seventeen hands. I didn’t see this as a problem, as it meant we knew we had much more to give; it would have been a problem if everyone’s hands had gone up, as that would have meant we were in trouble but this showed what a honest bunch we were. Next up was Catalans away which was always going to be tough and I challenged the boys not to answer me by winning the game but for all seventeen that played to be able to put their hands in the air when asked the same question after the game. They were desperately unlucky to lose the game in the last seconds and I really felt for every one of them as they really deserved the win. I didn’t ask the question after the game on the coach- I didn’t need to and I told them so. I was immensely proud of them and I knew the fantastic following of the Leigh army invading Perpignan were too. It was without doubt the highlight of the season for me and, yes, that above beating Wigan at home scoring 50. To see that amazing following of Leythers and see all the activity on social media of everyone having such a great time was priceless to me. Add to that spending time with my family and the families of my fellow directors with a bit of sun on our backs made it a great occasion, even if we didn’t get the win. Whilst having a great time in Catalan the pressure was mounting on me. I had to put funds in the Club to meet the payroll at the end of May which I hadn’t anticipated. I had been under the impression that once in Super League the club wouldn’t really need funding and knowing we had already had most of our home fixtures I was alarmed at the early need for financial support. This was made worse by the fact that I had taken the decision to use my money to strengthen the team further by buying the quota spots of Dayne and Willie and bringing in Sami and Morts. I knew we needed to add something to the pot and worked hard to do so. I am committed and don’t take a backward step unless it’s to take a bigger one forward. The crowds had taken a nose dive from their starting point due to the run of form which I guess is inevitable and I was bearing the brunt of it. Warrington gave us a serving on our return which put the final nail in our coffin that we were in the Middle 8s. It was a poor performance and in many ways lacklustre but it was Morts’ and Sami’s first game added to the hangover of Catalan and the deflating effect of that defeat. I went to the coaches’ office at 7am the following morning expecting to be there before them only to find them all busy away. I wasn’t happy with our lack of creativity in attack and poor defence in the game compared to what we had served up in France and wanted answers. One thing I could never ever question at any time was the work ethic and commitment of all the coaching and off field team. They had already reviewed and cut the video for the team review session and, as was pointed out to me, we had the same players with the same coaches with the same structures as we did when we turned Warrington over at home. What was frustrating me the most was the gulf between when we had a good performance or a bad one- they were polar opposites. I felt an immense amount of personal pressure at this time to remove Jukesy but I never once faltered in that regard as I knew that wasn’t the answer. I see the attention to detail and I am close to my players and trust what they tell me and none of them wanted to see the back of Neil. His wife probably doesn’t know this but I am going to say it anyway but Neil offered to take one for the team without any kind of pay-out if it gave the Club a better chance of keeping its Super League status. That’s how much he genuinely cares for this Club. He is a great bloke, an out and out grafter who gives everything he has got in an honest way. If I ever did part company with him as my Coach I would certainly start him the day after as a manager in my business that’s for sure. So we were in the 8s and I wanted to freshen the place up like I had done the previous year with new signs in and around the place and refocus the group as a new challenge with a line drawn under the past. I arranged for them to have a day out on a barge on the canal in Manchester before having some time off. I had the signs fitted with this year’s opponents on there and the strap line was ‘No Fear.’ Last year I had talked about how the Super League teams coming into the 8s were low on confidence were beaten groups were desperate and would be nervous and panicking with so much at stake. I needed to reverse that and ensure that wasn’t how we were approaching it. Everyone returned with a smile on their face and up for the challenge which had been boosted by nilling Salford to lift us off the bottom of the table and give us an easier run-in. Featherstone were first up and we went and did a decent job on them. I was very nervous about that fixture as I know how tough that can be so was glad to get it under the belt. Hull KR were next up and I really did get frustrated with this game. Jukesy had set the guys the task of running at 95metres a minute on the GPS as he knew they wouldn’t cope with it and for the first 15 minutes that was the case. However, the game got slowed to a grind and was played at 75metres a minute in the second half, more a Championship pace that didn’t suit us. I am not one for looking back and dwelling on things but you can probably read into what you want as to why the referee didn’t even get a Championship fixture the following week, let alone a qualifiers. I tossed and turned all night that night unsettled. I had been toying with the idea of bringing in Keiron Cunningham after the Widnes away performance and had spoken to his agent whilst in France along with Jukesy. I didn’t want to undermine Jukesy but felt he needed some support and a fresh face and voice around the place. I was going to be away at the trade shows as I was last year so was concerned that he would be going it alone with no support from me. I am not a good person when in limbo land as I am very decisive and have courage in my convictions. I say I am going to do something then set about doing it so I don’t like being unsure. I woke up with a clear head of what I wanted to do and met Kieron and the rest you know from reading the last programme. The boys answered well with an outstanding performance in Catalan which gave us some belief back, only for us to again turn up soft against Widnes. I just don’t know what it is with them. The pressure really does take its toll on your personal life as there is so much uncertainty. Whilst the players were battling it out on the training pitch I was at the Super League structure meeting on Wednesday where all owners or CEOs discussed how the sport should look in 2019. I can’t comment on that here at the moment other than to say the uncertainty surrounding that and our current position really added to the burden of stress. I had already told Jukesy that there would be no change in 2018 and we would have to be masters of our own destiny with how we performed on the pitch. My mate Marwan was coming up with a different permutation every morning of how we would still finish third even if we lost to Warrington- it was as clear as mud. The Warrington game was the worst I have watched this season. It was a poor game and it was like watching seventeen people commit suicide. We won the game more times than we needed to get wins in the Qualifiers, it was painful. We could have prevented every try, we gave three tries at least from terrible errors. Over the Pennines Hull KR had beaten Widnes and secured their return to Super League and I am particularly pleased for Neil Hudgell and the fans of Hull KR as they came out in droves to support him and buy season tickets once they got relegated which was his obvious motivator to keep funding the shortfall. Tim Sheens deserves huge credit for what he has achieved with the squad he has had and how he has used it. I genuinely am pleased for them and know exactly the relief they will all be feeling. It’s like walking on sunshine. As they say, one man’s gain is another man’s loss and it remains to be seen who will be relegated to the Championship. London have been playing very well and still have an opportunity albeit against two Super League teams in ourselves and Widnes. One thing is for sure at least one of us will lose our Super League status. So where does that leave us? Well I have thought long and hard on this one. In 2005 after getting promoted into Super League and seeing it not sustainable I walked away. Whilst I don’t have an appetite for the Championship I won’t walk away again at this stage as I still believe that this Club can become an established Super League club for many years and I am not giving that vision up after a setback. We have proven we can add to the competition by being competitive in our first year and not finishing bottom. We have met all the minimum standards including attendance and have had a positive impact at the club owners’ meetings, building friendships and business relationships that fellow owners want to see continue. Whilst the Super League structure remains uncertain at this stage along with any parachute payments and indeed our Super League status what isn’t uncertain and I can say with absolute clarity is I am going nowhere. I haven’t given up at anything in my life and have had many setbacks personally and in business but I don’t give in. As long as this town supports the Club I will support it. If the fans stay with us and still buy their season tickets and the sponsors still support as they have then I will maintain my support and keep us spending the cap with a team that will come straight back even if the structure doesn’t change to include us. I have already recruited some quality additions to the playing roster and have other irons in fires. I have also added some quality off field proven individuals to take the squad to another level and I have no intentions of going backwards. I have always taken the positives out of any situation and if we do go down we will have the opportunity to build again. We won’t be finished, we will come back stronger. That I can assure you. Knowing how you will deal with every eventuality gives you certainty in uncertain times and that is a healthy position for this Club. The lads still have it in their hands to perform and keep themselves in Super League, whether that’s finishing third, which is still possible or playing home or away in the Million Pound Game and I believe in them to achieve the goal of maintaining their Super League status and I will keep ‘Beleighving’ in them until the final hooter tells me otherwise. Before I go I would like to place on record my thanks to my fellow Directors who work tirelessly for the benefit of this Club putting in invaluable hours that the club could never afford to pay for. Jason has been immense to the business in what he has brought to the Club in terms of sponsors, not to mention his own financial commitment and sponsorship. The Club would not have as strong a playing budget if it wasn’t for him. Mike Latham the editor and author of this programme is a complete machine. He not only single handedly produces the game’s best programme, he pens all the Club’s media releases, attends all press conferences and does a first-class job hosting the Banqueting Suite, attracting some top quality guests. I am forever in your debt, Mike. Steve likewise is an astute business man who works tirelessly on the operational side of the business. 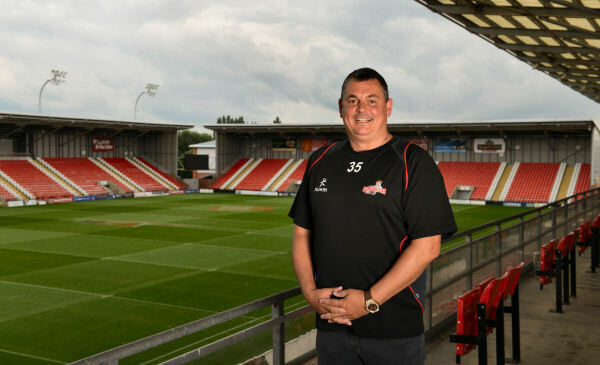 The hours he spends dealing with the VISA and RFL issues boggles the mind that he can also head up a multi-million pound ground-working business. Most of all I would like to thank each of them for their relentless and unfaltering support of me, especially during the difficult low times and their continued belief in my vision for the Club. If it wasn’t for them I couldn’t do my part and my investment alone wouldn’t be any use as most of it would go on salaries to fulfil their voluntary duties. I would also like to thank each and every fan who has contributed to this Club however great or small, be it in money or time and to all the sponsors whom are a vital lifeline to this club the heartbeat of this town. It isn’t a case of who watches the most games or who spends the most money as a person spending £20 a year percentage wise could be investing more than someone spending £100k. It is about contributing what you can, supporting through the tough times believing that doing so will bring better times ahead. That is what has got Hull KR back to where they want to be and it is what will get this Club where it deserves to be over the years whether it stays in Super League this year or not. I have a motto in my business: TEAM- Together Everyone Achieves More. If we stick together, owners, directors, sponsors, volunteers and fans alike we WILL take this Club onto great things, no matter how many storms we come across, we will steer this ship to its destination. Today we welcome the Directors, players and fans of Halifax and a special welcome to former player, their coach Richard Marshall. It’s good to see Halifax back in the four after missing out last year and I hope they can build on that next year with the increased funding. Halifax always give us a difficult game and whilst some people are talking about points difference I am not taking the two points for a win for granted. They have a good general in Murrell and he will want to control the game at his pace. They have some size about them and are well organised and coached by Richard so I expect a tough evening ahead of us but one I hope we can come through unscathed to put us in a good position for our trip to London.